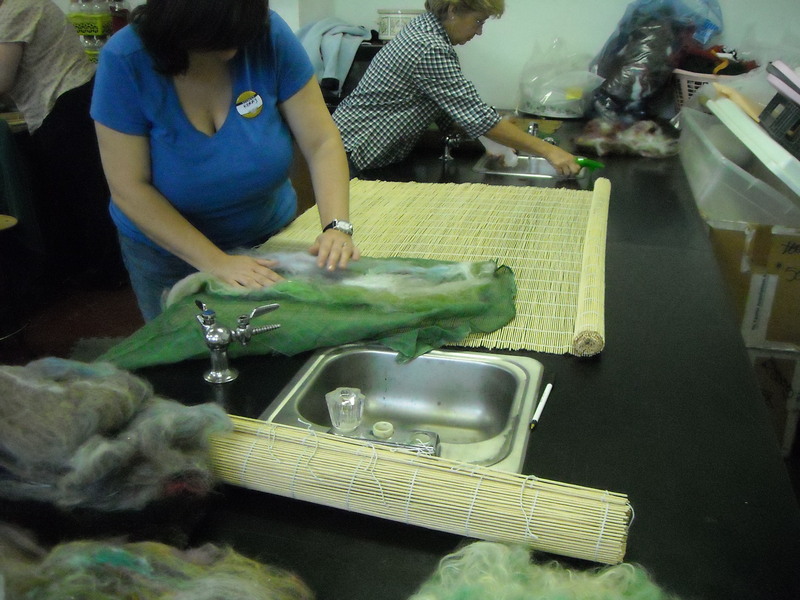 So you think you want to learn to needle felt? Well, here are my basic instructions. All you need is some wool fiber, a needle felting needle or two, and a foam base upon which to felt. Give it a try-you might like it! Loosen your fibers by gently pulling apart between your fingers. (You must pull the locks apart to open them up to dispel any veggie matter contained in them.) Arrange your fibers in a pleasing design on the foam base. Holding the top of the needle firmly between your thumb and fingers of your dominate hand, use a straight up and down pouncing/jabbing motion to work the fibers together. You MUST pull the needle out of the foam & fibers in the same direction as you inserted the needle or you risk bending or breaking off the needle tip,rendering it unusable. The goal is to hear a faint “squink-squink” as just the tip of the needle penetrates the foam base; the goal is NOT to firmly pierce the foam base. 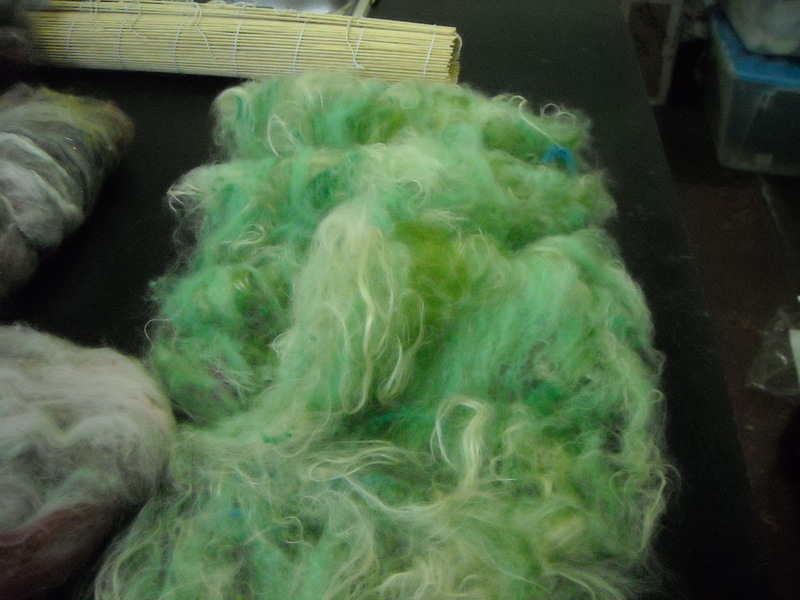 When the fibers appear evenly compacted, gently remove the prefelt from the foam and flip over. Continue to work the needle on this side, and repeat from one side to the other until you can no longer pull fibers apart. Finish your felt as desired, adding beads or stitching. If you are using an armature, be certain to know where your armature is in relation to the felting needle. The needle is fragile and will break if you strike it against wire, or another immovable object. Always “park” your needle in the foam base when not in use-this protects you from injury and the needle from breakage. Remember to use your elbow as the fulcrum to move the needle through the fibers, NOT your wrist. Take frequent stretching breaks to avoid fatigue. Most important of all-HAVE FUN STABBING SOMETHING INTO EXISTENSE! Until next time, go FELT SOMETHING! I apologize for the late evening posting-my son & daughter-in-law had an emergency need for Granna to sit with young master Ezra for a spell. All is well, and I got to see my grandson-good news all around. 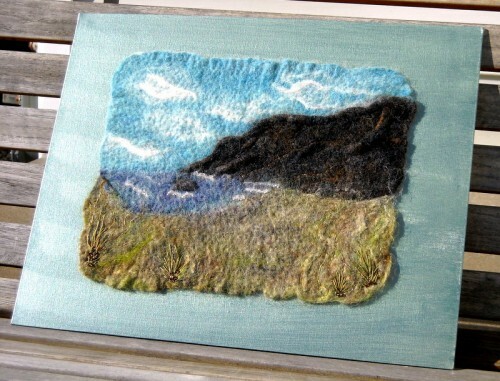 Until tomorrow, Wordless Wednesday, go FELT SOMETHING! 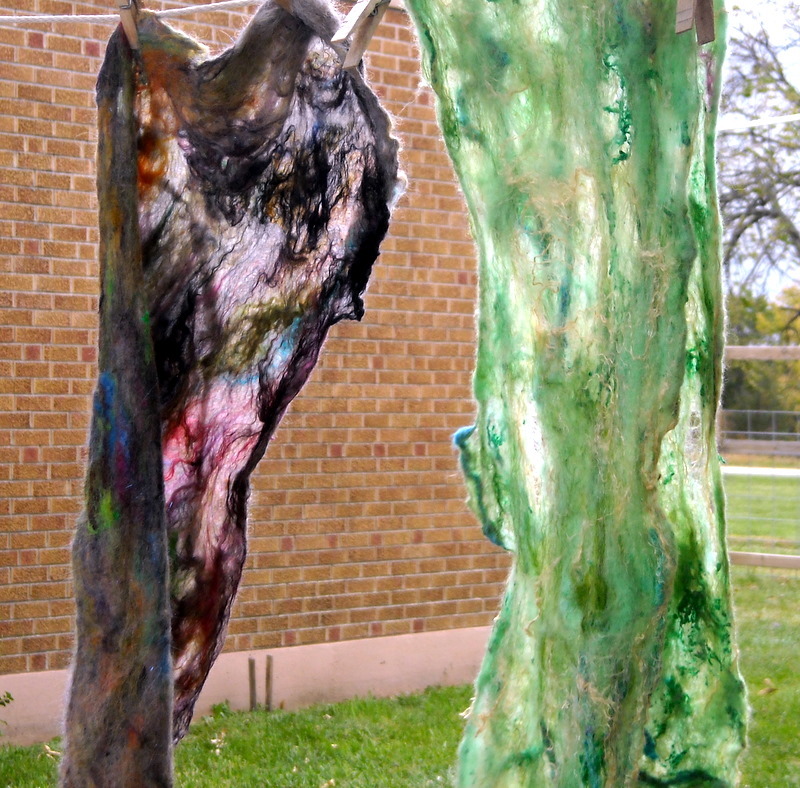 Thank you, the Nester http://www.thenester.com/ , for your inspiration to blog for the month of October. I think this will be a challenge akin to NanoWriMo http://www.nanowrimo.org/ in that it will DEMAND I be intentional about blogging-a good thing! So-what to expect here on annasplaceofholding? October has been designated as production month given that my holiday show season begins the first weekend of November and I want to have TONS of new product available for my customers http://www.artfire.com/ext/shop/studio/designsbyanna. Additionally, I have a needlefelt sculpture to complete for our local TWISTED! 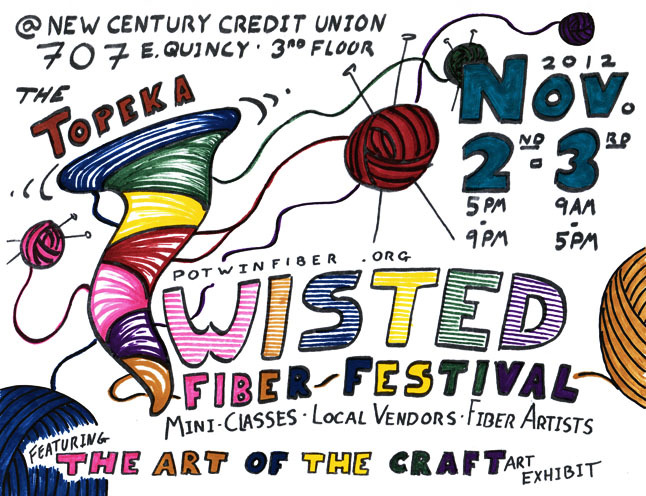 Fiber Fest http://www.potwinfiber.org/Site/Topeka_Twisted_Fiber_Festival.html AND I’m working out the thoughts for doing a Kickstarter http://www.kickstarter.com/ to ramp up my creativity to the next level! Plenty of fodder here to blog daily. So, for today, you have been warned-there’s going to be some FELTING going on during the month of October and I hope you’ll check in on me daily to see what I’ve been working on! Until tomorrow, GO FELT SOMETHING!